The buzz cut is a classic haircut popular with everyone from athletes to musicians and even military professionals. It's really simple to create with a similar length all over. Here's how to cut your own hair for men, to produce a buzz cut yourself. Step 1: Think about the length you want and choose the corresponding clipper setting. Start clipping at the back and the sides, using upward movements. Step 2: When the back and sides are finished, you're ready to style the top of your head. Cut your hair in smooth straight lines from front to back across the top. If unwanted cut lines are showing, blend these in with upward motions. 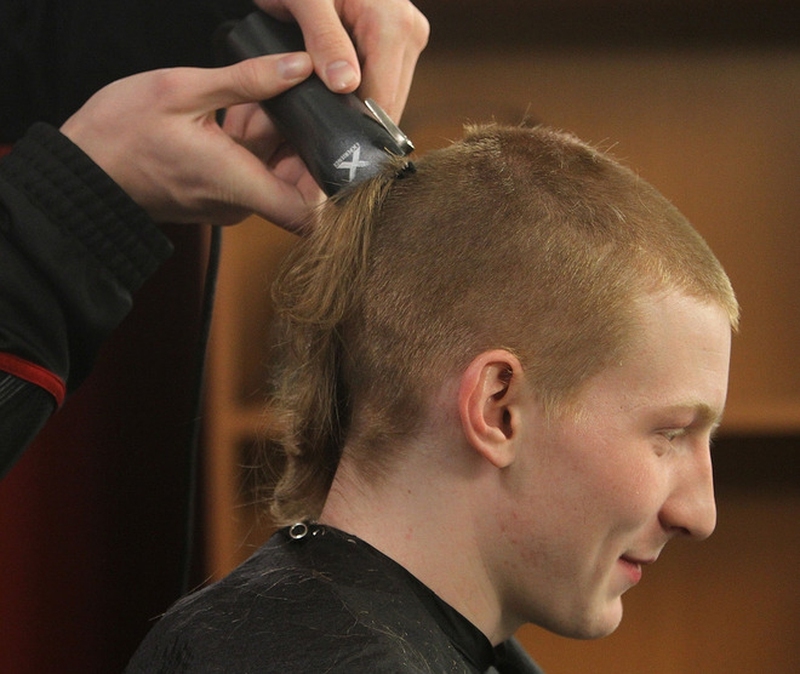 Step 3: You may need to perfect the buzz cut at the sides. Be careful and use concise strokes. Ear trim guides may help. Step 4: The inverted clipper technique can tidy the neckline. Carefully use short strokes for tight, straight lines. Here's a guide on how to cut your own hair. Men from many walks of life find that these various self-designed buzz cuts are an easy and stylish way to get great haircut. This versatile haircut has short sides and a spiked strip of hair on top. You can choose the original Mohawk, with the sides almost bald, or the more conventional faux-hawk, with slightly longer sides. Instructions: You need hair at least an inch long. Start by shaving the sides to the desired length. Now style the top by blow-drying with your head between your legs, using spray, gel, sugar or starch to hold the style in place. Allow to dry before you lift your head. This consists of short hairs on the sides and longer hair on top. Instructions: Start with hair 2-6 inches long. Decide the width of the middle section and how short you want to cut. Clip the sides and back of the hair on a short clipper setting. Now you can cut the top of your hair then style it the way you like. Here, the top of the hair is cut such that the front part is longer and can be styled into bangs or pompadour if you wish. Instructions: Cut the back and sides of the hair to a uniform length. Next, style the top of the head, creating a back to front transition through gradually cutting horizontal hair segments. Taper the lower part of the top section to blend with the sides. This is where the top of the hair appears square with longer tapering at the sides and back. Instructions: Create the "block" on top using guards. Next, use the clipper to fade the hair at the sides and back. This haircut has a strip of hair across the top, and doesn't need any styling or fading. Instructions: Cut the sides and back using short clippers, then the top using the next longest setting. Or try the "high and tight recon" style, with shorter sides and back, and a narrower top section. These three styles are the easiest, as the hair is the same length all over. Instructions: For the induction, the hair is cut to the shortest possible length without using a razor. The burr is also very short - less than ¼ inch in length, whereas the butch cut is slightly longer. For these cuts, ensure you shave against the direction of hair growth. Check for bumps on your head. Everyone has some lumps, but these won't be obvious until you shave. Before the cut, run your hands over your head to check for any major bumps. Think about any scars you have. Headscars may show through a short buzzcut, so consider whether you want it to be seen. Be careful if you have large ears. Buzz cuts may not be the right choice for you. If you do go ahead, opt for styles with slightly longer hair at the sides. Consider your head shape. Some people have irregular head shapes that may be highlighted with a short hairstyle. Do you have a receding hairline? If so, a buzz cut may be a great choice, as it's flattering and can make you appear manly. Remember you can choose the length. There are many different buzzcut options: uniform styles can have many different lengths, or you can vary the length to create one of the styles described above. Try faded buzz cuts. This hairstyle can be mixed up with low fades, hide fades, and longer lengths on top.